The basij have their guns. It’s too bad Barack Obama cut funding to the Iranian democracy activists. REGIME USING AXES & DAGGERS ON PROTESTERS! 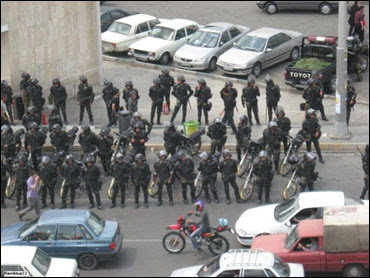 The police are massing at Revolution Square in Tehran. Supporters of Iranian opposition leader Mir Hossein Mousavi rallied in Tehran on Saturday, despite a threat by the government to crack down on demonstrators, witnesses reported. The witnesses told the Associated Press that protesters are holding a number of smaller rallies to demand a new vote after last week’s national election gave President Mahmoud Ahmadinejad a landslide victory. Earlier Saturday, fire trucks parked around Revolution Square, while riot police descended on Tehran University, where protesters and security forces have previously clashed. 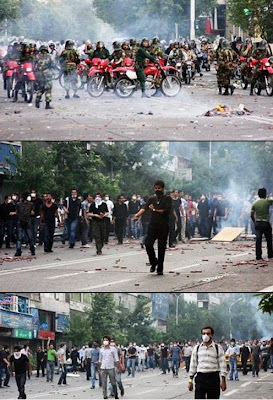 Police and members of the Basij militia flooded the streets of Tehran. Iran Press News— AFP reports from Tehran, Zdshvrsh forces are widely deployed at Revolution Square. 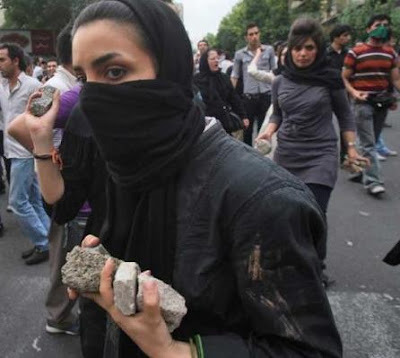 The basij forces are preventing the protests and beating the demonstrators. There were loud protests last night– the people were on their rooftops screaming out against the regime. More video from the streets of Tehran — Here. Iranian blog Revolutionary Road is following the developments from inside Iran. 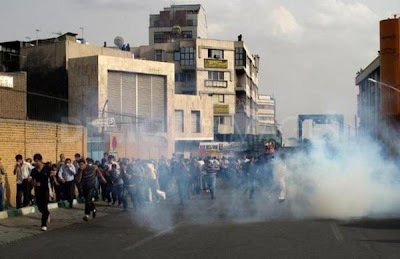 Winston is reporting on rioting in Tabriz, Mashad, Isfahan, and Ahwaz. UPDATE: Mousavi says he is ready for martyrdom. ** Ahmadinejad & Mousavi Supporters Clash In Tehran! …MASSIVE DEMONSTRATION!